What is Resilience & Why Does It Matter? 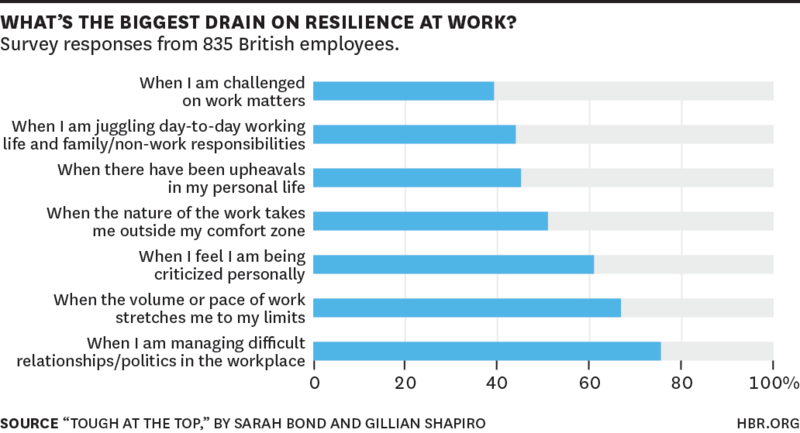 A small but intriguing new survey by a pair of British consultants confirms the importance of resilience to business success. Resilience is defined by most as the ability to recover from setbacks, adapt well to change, and keep going in the face of adversity. But when Sarah Bond and Gillian Shapiro asked 835 employees from public, private, and nonprofit firms in Britain what was happening in their own lives that required them to draw on those reserves, they didn’t point to tragedies like the London Tube bombings, appalling business mistakes, the need to keep up with the inexorably accelerating pace of change, or the challenges of the still-difficult economy — they pointed to their co-workers. Originally published by Andrea Ovans for Harvard Business Review.